Current head coach Luciano Spalletti took the reins at Internazionale in the summer of 2017. After an impressive start to his first season, Inter topped the Serie A table after 16 matches, remaining the only unbeaten side in the league. The Italian eventually guided his new club to fourth, crucially securing Champions League football for the first time in seven seasons. Inter is the 59-year-old’s seventh Italian club in a coaching career dating back to 1995, when he took charge at Empoli. He won back-to-back Italian cups (2007, 2008) in his first spell with AS Roma, and in his only management job outside his native Italy guided Zenit St Petersburg to a Russian league-and-cup double in 2010. In his first spell with Roma, Spalletti (below) often employed a 4-2-3-1 structure featuring the false 9 role that in later years swept across Europe. Francesco Totti was often charged with the dropping movements back into midfield, creating space for the likes of Mancini, Simone Perrotta and Rodrigo Taddei to penetrate into the final third. Spalletti’s consecutive second-place finishes in 2007 and 2008 proved the effectiveness of this strategy. Despite Spalletti’s early successes at Roma and Zenit, he hasn’t won a trophy since 2012 – and his second spell at Roma was at times complicated by his handling of club legend Totti’s game time. Despite this, he led the Rome club to respective third and second-place Serie A finishes in his two seasons, qualifying them for the Champions League on both occasions. An encouraging first season in Milan silenced any remaining doubters, but Spalletti has not enjoyed the best of starts to the domestic season. A positive showing in Europe would do his credibility no harm at all, although drawing Tottenham and Barcelona makes qualifying for the last 16 a tough task. In his time at Inter so far, Spalletti has continued to prioritise a 4-2-3-1 structure – albeit a more traditional one, with the prolific forward Mauro Icardi as the focal point of the team’s attacking play within the final third. Similar to his time at Zenit, Inter have used two defensive midfielders and a number 10 within the central lane. Two from Marcelo Brozovic, Matias Vecino and Roberto Gagliardini provide solid central protection in the defensive midfield roles, while summer signing Radja Nainggolan – he has joined from Roma in the wake of his shock exclusion from Belgium’s World Cup squad – provides ideal central support to lone striker Icardi ahead of them. Inter’s full-backs often fly forward in attack, particularly as they set up with two defensive midfielders who rarely venture ahead of the ball. Sime Vrsaljko and Kwadwo Asamoah are two very offensively minded full-backs who can provide effective attacking crosses into any opponent’s penalty area. Inter’s return to the Champions League will see them come up against Tottenham, who may set up with a defensive back three that Spalletti, who has been known to mirror opponents’ formations, could replicate. Stefan de Vrij, who joined from Lazio this summer, would most likely start in the centre of such a back three, with Danilo D’Ambrosio and Milan Skriniar on either side of him. Vrsaljko and Asamoah would be the obvious choices to maraud forward from wing-back, while Nainggolan and Ivan Perisic – another of Croatia’s World Cup finalists – would support Icardi from the inside channels in a narrow attacking triangle. Having Icardi remain high and central means he can often occupy two central defenders with clever positioning. This can open up space within the inside channel, for Perisic in particular to cut inside from the wide left position and shoot, or pass and combine with Icardi in the central lane. Icardi’s higher positioning can also create one-on-one situations for Perisic against the opposing full-back. As the Croatian is effective on both feet, he can also beat his man around the outside, providing crosses for Icardi to attack inside the penalty area. Whichever way Perisic decides to attack his marker, Icardi’s occupation of the central defence is critical to Inter’s attacks. When remaining high, Inter’s back line also has the option to play forward passes from deep into feet or in behind, as Icardi has the versatility to show for both. Inside movements from Perisic and Matteo Politano can draw opposing full-backs into a narrow structure, creating space for Icardi to make curved runs around the side of the central defence (above). From here, supporting runs from Nainggolan and the wide midfielder from the opposite side mean Inter can get good attacking numbers into the box. Should Spalletti choose to mirror a possible back three, Inter often leave space in behind for balls over their defensive line (below). When Tottenham have used a back three, the in-form Lucas Moura has partnered Harry Kane in attack, with Dele Alli supporting from midfield. The defensive line of five that Inter have set in the past could be exploited by Moura, whose speed over 10 to 15 yards simply can’t be matched by any of De Vrij, Skriniar or D’Ambrosio. De Vrij in particular would be crucial if used as the central figure in a back three, and not just for the defensive organisation that would be his responsibility. 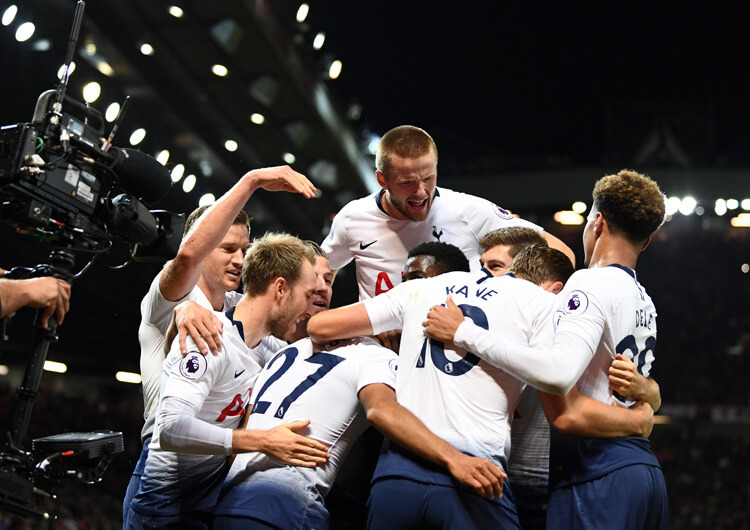 If Harry Kane were to occupy the Dutchman as Tottenham build through the thirds, he might find it difficult to both organise and keep track of Tottenham’s deadliest finisher. 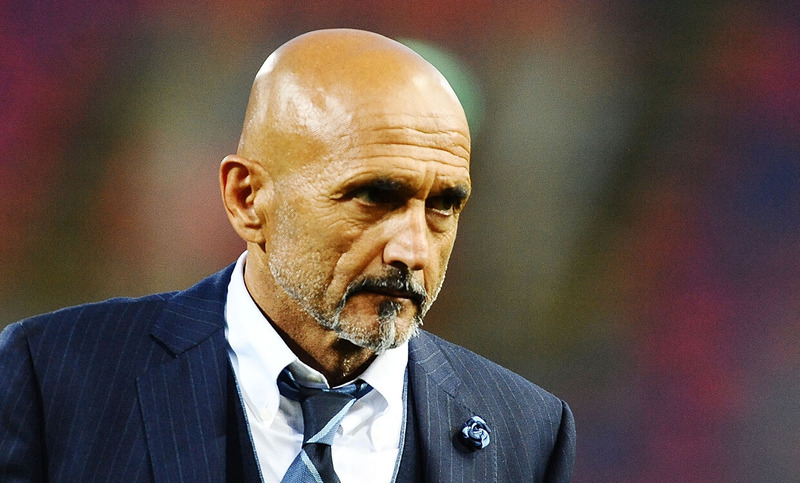 Whichever formation Spalletti opts for, this could be one of the game’s crucial battles. After spells with both the Barcelona and Sampdoria youth teams, the Argentina-born Icardi (above) moved to Inter after only one year of senior football with Sampdoria. Now in his sixth season with Inter, club captain Icardi has become the club’s main attacking talisman. Despite being persistently linked with moves away from the San Siro, he has now scored a century of league goals for the club and has twice been Serie A top scorer. 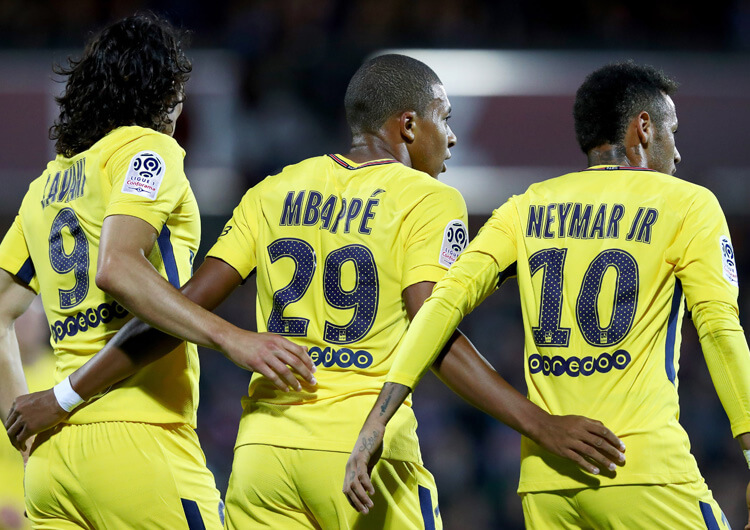 He has netted more than 20 league goals in three of the past four seasons. Icardi doesn’t appear the most aggressive of strikers, but his ability to attack crosses – and score from them – is equal to that of a traditionally powerful centre forward. Often scoring headed goals with deft touches from outswinging crosses, Icardi is a deceptive threat in the air (above). Equally, if the ball is worked into the penalty area from a central build, the 25-year-old is a lethal shooter. 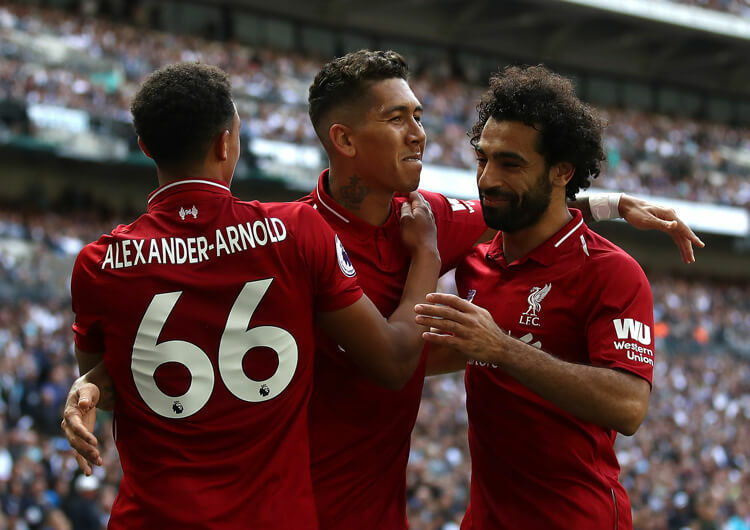 He can run in behind the shoulder of the last defender to finish one on one, or shoot in highly congested areas, using the defenders as a screen from the goalkeeper’s vision. Icardi’s trademark move is to fake his shot, hoping his marker will attempt to block the first disguised effort. Should the defender fall foul of his trickery, Icardi simply cuts back in the opposite direction (below), leaving his marker on the ground. From here, he only has the goalkeeper to beat – which he often does. The forward’s main area of improvement in recent seasons has been in his ability to link up play as the highest player forward. Icardi is starting to bring other attackers into play more and more, with subtle flicks and knockdowns (below), as the variety of balls into him changes over time. In his early Inter years, Icardi was very much focused on running in behind, or consistently turning after receiving. This didn’t always prove successful, should he be double-marked or the space in behind be unavailable. 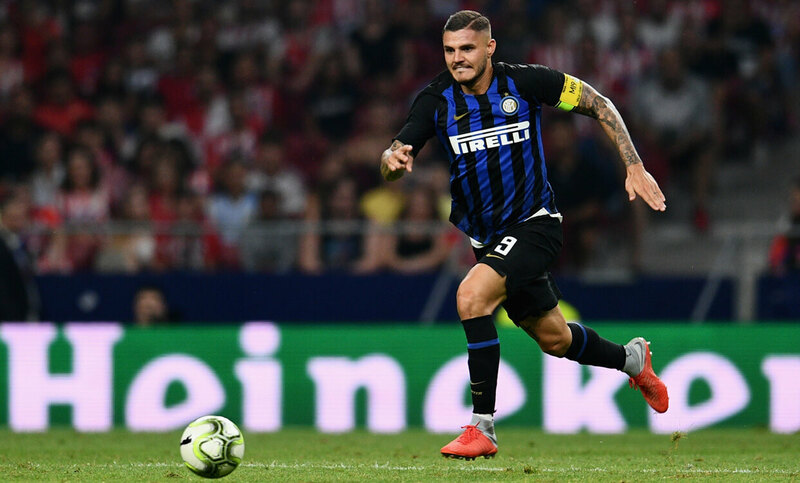 As he has developed, though, Icardi has demonstrated improvements in his awareness to combine with deeper runners and utilise the attacking talents of those around him – such as Perisic from the left or new teammate Nainggolan from deep.